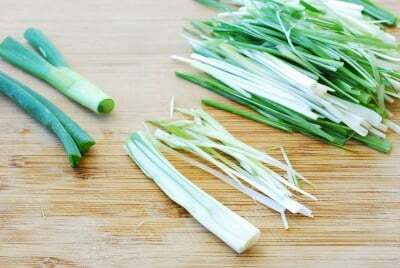 Green onions, also known as scallions, are called pa (파) in Korean. 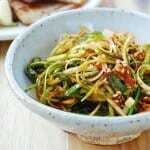 When julienned, they’re called pachae (파채). 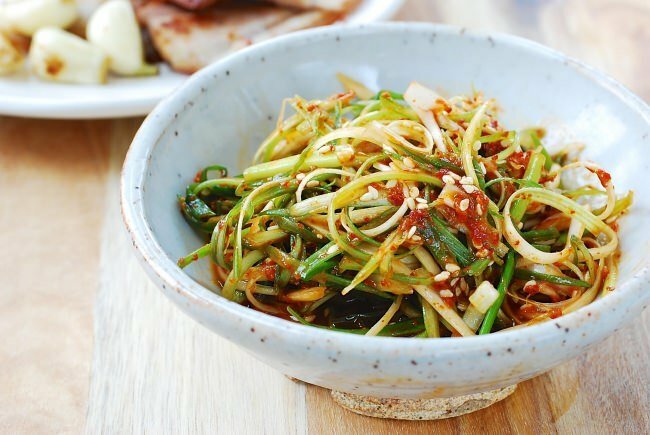 Pachae muchim (파채무침), also called pa muchim (파무침) or pajeori (파절이), is a seasoned scallion side dish that’s highly popular with grilled meat dishes. 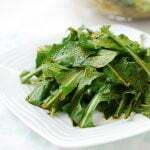 It is particularly popular with meat dishes that are grilled unseasoned such as samgyupsal gui. 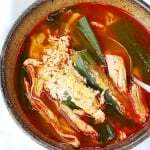 It’s also great with bossam or my slow cooker pork belly (samgyupsal). 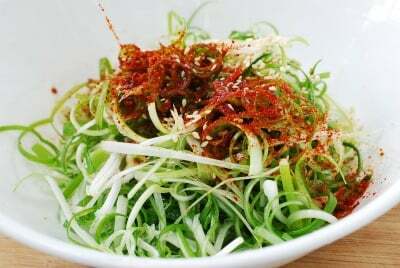 Pachae muchim is so popular that there are even special cutters for julienning scallions in Korea. More conveniently, julienned scallions are sold at markets in Korea. I’ve seen them sold at Korean markets around here as well. My Korean butcher shop gives out complimentary julienned scallions when I buy meat from them. If you have to cut it yourself, it’s not that hard with a regular knife. It doesn’t have to be cut perfectly uniform. Once soaked in cold water to remove a bit of pungency and slimy substance, the scallions become perky and nicely curly. There are several ways to dress up the scallions. 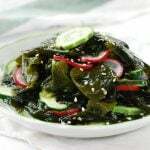 One popular way is to simply toss them with sesame oil, gochugaru, and sesame seeds. 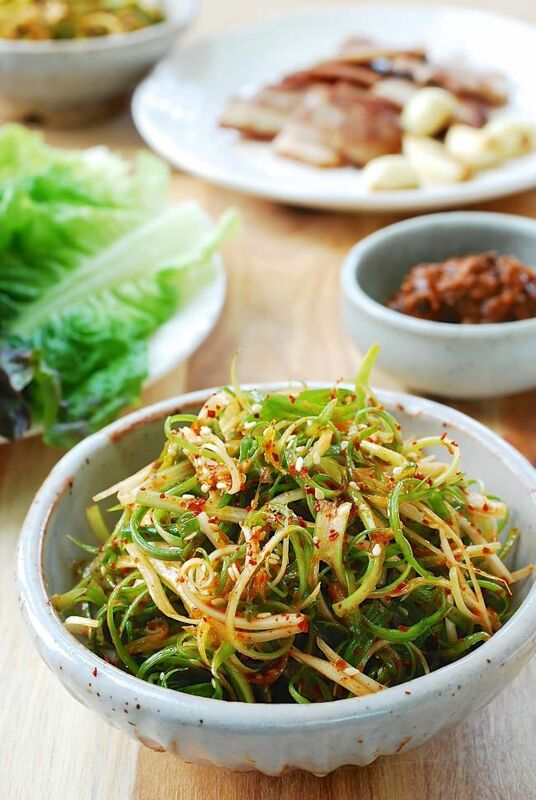 This is a nice option when serving with ssamjang for ssam (lettuce wraps). Due to the lack of salt, it stays fresh longer, so this version is favored by restaurants. 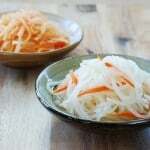 Another option is to fully season by also adding either soy sauce or salt along with sugar and vinegar. Once the salt content is added, the scallions wilt down very quickly, so be sure to dress it right before serving. I am showing you how to make both options here. Try them both and see which one you like better! The measurements here are only guidelines, adjust to your taste. 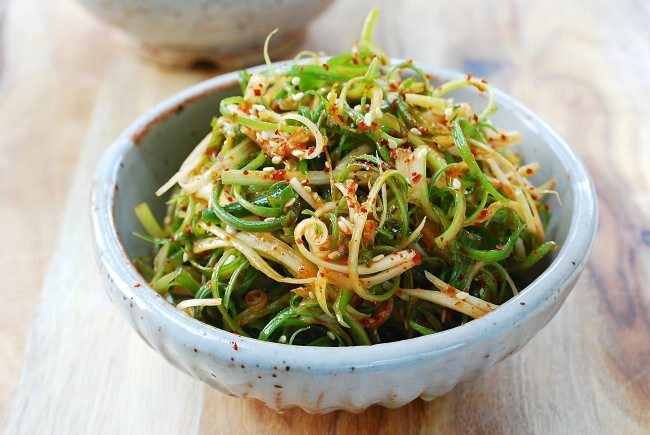 Wondering how to keep your leftover scallions fresh? Have you had scallions go bad in the fridge? In the winter, I keep them in a glass of water. They stay fresh and even grow taller. During warm weather, I plant them in a pot of soil, and pull them whenever I need to use them. 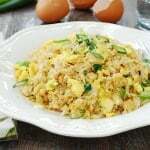 A simple side dish made with scallions which is great with grilled meat dishes! Cut the scallions crosswise into about 4-inch lengths. Thinly slice each piece lengthwise. 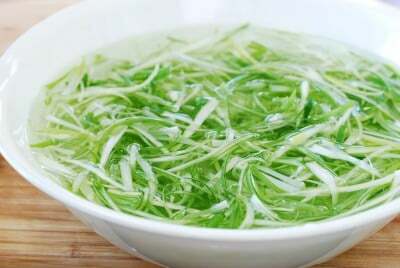 Soak the scallions in cold water for about 10 minutes. Drain well. Option 1: Add the gochugaru, sesame oil, and sesame seeds and toss well. Option 2: Right before serving, add the soy sauce, vinegar, and sugar to Option 1 and toss well. I absolutely love Korean food. I have plans to make my first ever trip next year, and I am so excited. I use your recipe’s because they are so easy and delicious! Thank you so much for all your effort and time to help those of us who are Korean at heart!! Forgot to leave the scallions in the cold water, but option 2 still worked out very well and tasted just like restaurant muchim, even if I used artificial sweetener as opposed to sugar (I’m on a low carb diet…not the best as a Korean who grew up eating 3 bowls of white rice a day for 30 years). Thanks for posting this! I looked up a recipe on Naver and they recommended that you roll up the scallion before you chop them to make them curly, but this is way less labor intensive. Great to hear it turned out well for you! Thanks, Fiona! Is the gochugaru a powder or a paste. I am looking to get some on amazon but not sure which to get. This looks so good! Gochugaru is powder/flakes, and gochujang is a paste. Both are staple in Korean cooking! I made this last night and it was so good! Never knew I could make a salad out of spring onions. Even though I totally cut off my nail in the process of julienning the veg, it’s worth it! Ouch! Be careful next time. 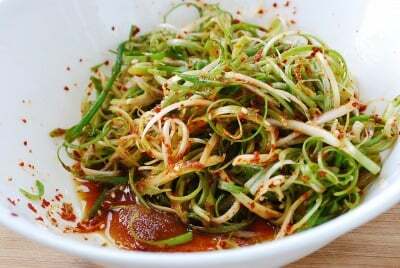 If you like this dish, you may also like my kimchi made with scallions – pa kimchi. Check it out. What type of vinegar? 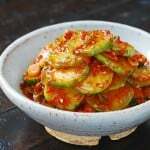 Would rice vinegar work? Yes rice vinegar is good one to use. Any clear vinegar will do though.